You will not know who is performing until you land up at the venue on the day of the concert; and you can’t buy tickets, you can only apply for them. It’s not particularly difficult to find places, mostly pubs, restaurants with live music gigs in Bengaluru. It is also not difficult to see people chatting or focusing on their food and phones as many consider the music is just there for the background ambience. However, Sofar Sounds is trying to change this notion. 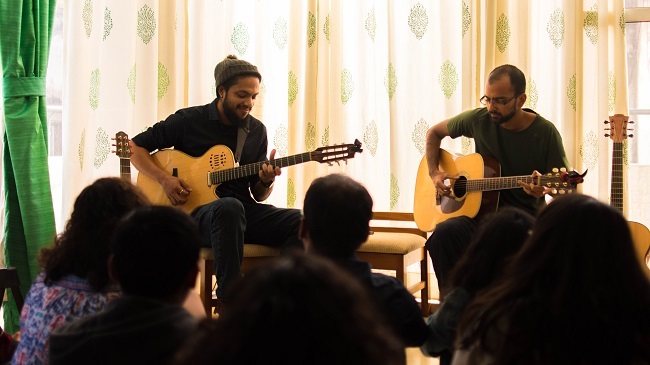 With secret concerts and live performances by diverse artists at people’s homes, they are trying to bring back the magic of really listening to music. Sofar Sounds began in London in 2009. One day, three friends – Rafe, Rocky and Dave – went to a pub which featured live music. But when they looked around, they saw everyone busy on their phones – a sight that disappointed them immensely. Dave was a musician, and so, when Rocky and Rafe decided to change things up, they invited him to play at one of their friends’ homes. The audience was only six people, but everyone was so engrossed in the music that they could hear the clock ticking when there was silence. With this concept gaining popularity in their circle, Rafe and Rocky thought this could be something bigger and started Sofar Sounds. 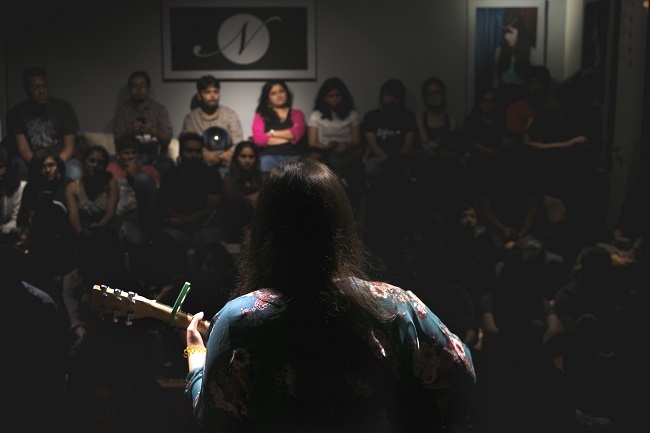 Today, Sofar Sounds has spread to 400 cities worldwide, including 12 Indian cities like Bengaluru, Chennai, Kochi, Kolkata and Delhi. The Bengaluru chapter began in 2015. One of Sofar Sounds present members, Prathana Sen, was studying at Leeds University when she first heard of the concept. She began volunteering for them soon after. When she moved back to India, she decided to introduce the concept in Bengaluru. Sofar Sounds curates live gigs not just in homes, but also in commercial spaces. But several things differentiate them from your run-of-the-mill live concert. For starters, the concerts are secret. You will not know who is performing until you land up at the venue on the day of the concert. And you cannot ‘buy’ the tickets either. Once the date and venue is decided, the concert is opened. You can apply for a ticket, and you may be selected through a calculated lottery system. When a person is selected, they are informed a day before the event, and can usually bring along a plus one. The Sofar Sounds team also makes note of people who were allotted tickets but did not turn up. Not everyone can host a concert at home. Harsha explains that they have an entire process when one applies to host a concert. Two team members, Chitra Devaraj and Sonia Malani, visit the venues to check out the space and acoustics. The venue should be able to accommodate at least 20 people, and they have a safety checklist as well. Once the hosts are on board, Sonia and another team member, Vishesh Kapil, coordinate with artists who would perform here. Each concert usually features three artists – each belonging to a different genre – and no headliners. And just like the spots for a gig at a commercial space, while hosts will have three or four seats for their own guests, the rest will be opened to the public. “That’s the beauty of it. People who apply to us to host are open to welcoming strangers into their homes. All of them just bond over their love for music,” Harsha says. People have mistaken them as organisers of live gigs at parties, and Harsha says they’ve turned down many such requests. A majority of artists who perform at Sofar Sounds apply through their website, but sometimes organisers can contact musicians they find interesting. The musicians then have to send a sample of their recorded work as well as a live link, and then they are selected. There is no entry fee for a Sofar Sounds concert – they are crowdfunded. However, audiences are reminded to contribute towards the end with a minimum amount of Rs 300. “The system is an unconventional one, but I think if a person values the musician’s talent, it’s a fair amount. It’s a slow change, but it’s catching up,” Harsha says. 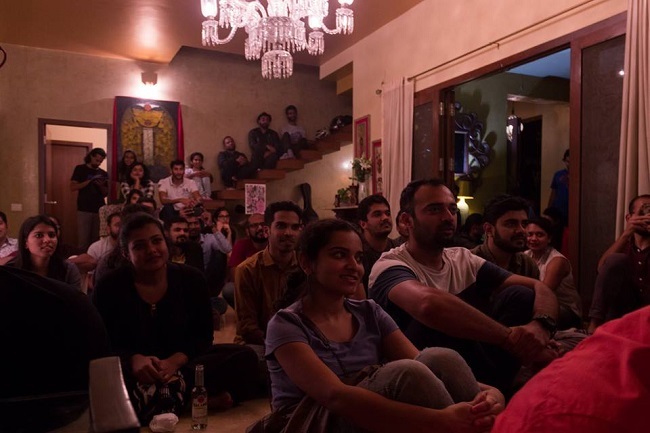 Harsha says that the people who come for Sofar Sounds concerts are all music lovers who enjoy performances regardless of the genre being performing. Between each artist’s performance, there is a 10 to 15-minute break where the team encourages people to mingle and speak to each other. “We have met so many interesting people through these concerts. In fact, in our Washington DC team, two people met through Sofar Sounds and are now married!” Harsha laughs. But how easy is it to keep people from being distracted by their phones for two hours? “Many times, our team are the only people on the phone in the room because we are putting up stuff on social media,” Harsha laughs. “Apart from a few people who take 20-30 second videos, we haven’t seen our audiences concentrate on anything but the music,” he says.